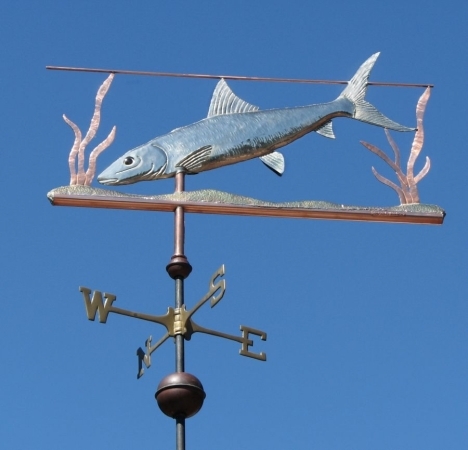 This Bonefish Weathervane is popular with anglers. Fly fishing for bonefish, called bonefishing, is a popular sport in the Bahamas and southern Florida. Since bonefish live in shallow inshore water, fishing may be done by wading or from a shallow-draft boat. Bonefishing is mostly done for the sport, so the fish are released, but they may also be eaten. A typical recipe is a split fish seasoned with pepper sauce and salt, then baked. Our design incorporates the habitat bonefish prefer and the waterline, to illustrate the shallows. Our customer for the version pictured here requested optional gold leafing on the fish swimming over a ‘sandy sea floor’ of brass, and copper water plants. When this piece begins to weather, the various metals will show lovely subtle differences, and the gilded fish, with its glass eye, will remain a bright contrast. 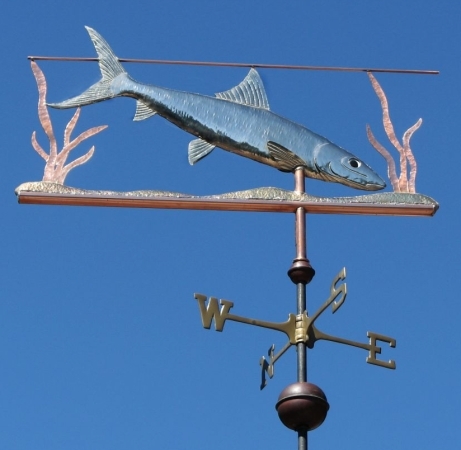 We are very pleased with this piece, and it is adaptable to other fish that inhabit the shoals. If this interests you, we are happy to discuss some modifications.